← Update on the Health of George Adkins. We Know Shuffleboard Can Become INTENSE; but Let’s Keep It Civil!!! 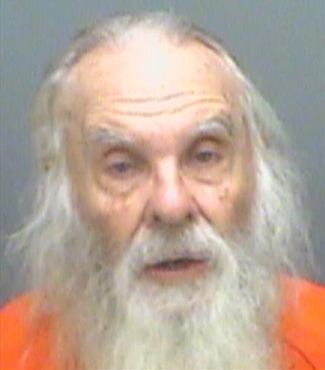 SEPTEMBER 15–A dispute on a Florida shuffleboard court turned violent yesterday when an 81-year-old man allegedly punched a fellow pensioner and struck him with his shuffleboard cue, according to court records. 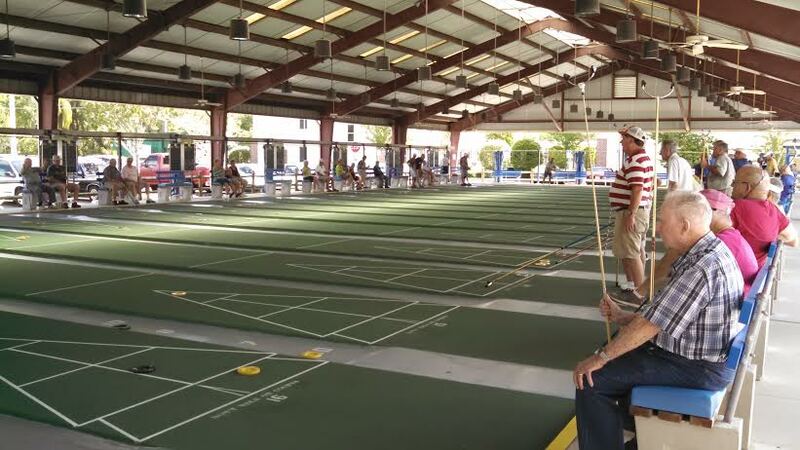 The confrontation Wednesday afternoon occurred at the Pinellas Park Senior Center, which includes an open-air pavilion with 16 shuffleboard courts (as seen above). “Shuffleboard is a popular sport for the ‘Seniors’ in Pinellas Park,” according to the senior center’s web site. 12 Responses to We Know Shuffleboard Can Become INTENSE; but Let’s Keep It Civil!!! To be honest, I`m surprised it doesn`t happen more often, especially in “Park Play”, where the difference in skill levels, and knowledge of the game can be huge. Obviously it shouldn`t happen, but unfortunately, there`s some Really Big egos out there. USANSA and FSA and his home park should ban this anti-sportsman regardless of his age from all events for a specific timeframe. Big egos or not it’s ONLY a GAME for enjoyment. This guy is facing a lot more than just a ban from shuffleboard… how about, assault charges! Bob completely agree but all we can do is ban him. Let the courts do the rest. But if we do nothing that would be an absolute shame. I hope USANSA and FSA react accordingly. Bob, I was teaching newcomers down at the St. Pete Shuffle Club last night and I used this as an example. I told them I have been placed in the kitchen time after time and multiple times in the same game or tournament by the best shooters in our game including Earl Ball, Stan Williamson, Glenn Peltier, Ken Offenther and a whole slew of others and when it happens I respond well done sir now lets see if I can get it the hell out of there. Its part of the game so accept it and learn to do it as well. Bob, Michael: the investigation is not yet final and yes Hayden was at fault for bodily conduct. This incident happened shortly after noon on Wednesday, the physical marks were not veiwable Thursday evening.BUT and we will find out which shuffler instigated and kept pushing the arguement rather than just remark and let it be. The court system is handling Hayden , but what about Sutton. This is not the first arguement to escalate beyond just suggestion as I personally have seen situations with Sutton within these last 6 months. . In a playyard two youths fight, both are tsken apart and both are punished. Shuffleboard is a fun game not to be meant to grow into bullying. How do we punish one but not the other. That why we have managers/presidents of clubs and associations. The main subject here was walking on the courts. And everyone knows your not suppose to but why focus on one person when in the court right next door other shufflers were one the courts too. When they pull court assignments in the morning at Pinellas Park, the crowd and city employee all walk on the courts. It’s not right but it happens every day. In our International World Championship we have NO PENALTIES in our Constitution as an official rule. We have many languages, different cultures and varied rules of playing in their nations that colds cause massive conflicts and embarrassing situations. We are highlighting the friendship and cultural exchanges that center over the GAME of shuffleboard. If you’ve never seen a world championship everyone should come and experience one. Shuffling at Pinellas Park has been a great experience for me….many of the players are in the 70 to 80 age group…and it seems like they are all great players…I’ve had the opportunity to talk with many of the folks there, and they are the nicest people would ever want to meet..
Herb was one of those players…for those who don’t know him, he is a very soft spoken man…he is a college graduate and a veteran…..always a fun person to talk with….when I turn 81, I hope I have half his energy he has.. I fully agree with you, Gary. Shuffleboard is Herb’s life so let’s do all we can to help him to continue with it. Banning him from playing for a short period of time is probably acceptable but not for life time. I made inquiries yesterday as to how many at Pinellas Park would be willing to help with bailout funds. Response was good, not great, but I did not take action. However, fortunately, he was released yesterday. Yeah !!! Gary, the message to you yesterday , under my name( because of it showing on the computer), was written by my wife, Shirley. She became quite emotionally involved in this horrible , blown out of proportion episode which appears to be giving Pinellas Park a bad name. Too bad, because it is such a great facility, with so many pleasant staff members. Aren’t we lucky ?. I thought shuffeboard was a ” non -contact sport ” ?